Could you help transform the prospects for a child through the power of books and stories? Local literacy charity Beanstalk has launched a new campaign for 2018 to highlight the extraordinary difference members of the community in Suffolk can make by volunteering in primary schools to support children who struggle with reading. 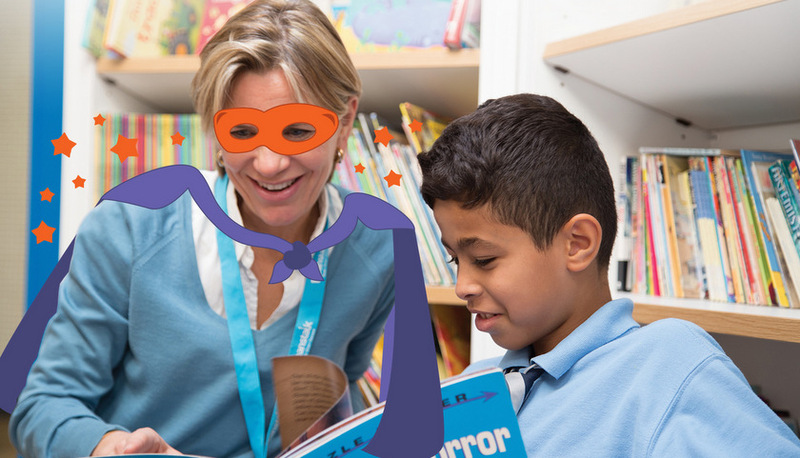 The work Beanstalk’s ‘reading heroes’ carry out will improve the lives of children that need extra help to prevent them from falling behind at school and to bring enjoyment into reading. For over 40 years Beanstalk has recruited, trained and supported reading helpers in primary schools to provide one-to-one support where it is crucially needed. Many children in Suffolk still leave primary school not having met the expected standards of reading which can lead to all sorts of problems in later life. By working with children who have either fallen behind with their reading, lack confidence, or struggle with their fluency or comprehension, Beanstalk’s reading helpers can make a significant difference to their future prospects. Their one-to-one sessions twice a week with the children they support will help them progress while also helping to encourage reading enjoyment. In 2016-2017 Beanstalk reading helpers supported approximately 840 children in the East of England with their reading.